Peter Sagan led overall leader Chris Froome across the finish line in a frantic finish in Montpellier to claim his second stage victory of the 2016 Tour de France. 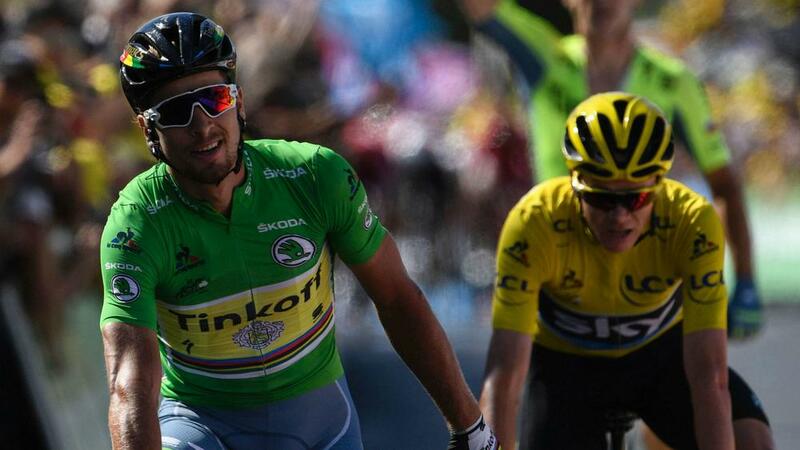 Tinkoff's Sagan - winner of stage two and current wearer of the green jersey - formed part of a late breakaway with team-mate Maciej Bodnar and Team Sky duo Froome and Geraint Thomas, with the chasing pack leaving it too late to make their move. Strong winds made for a chaotic stage, with the yellow and green jerseys' involvement in a sprint finish providing a fitting end to a day described by Sagan as "crazy". Froome's second place on the 162.5km ride from Carcassonne saw him open up a 28-second lead over Adam Yates (Orica-BikeExchange) at the top of the general classification after 11 stages. Arthur Vichot (FDJ) and Leigh Howard (IAM Cycling) made the initial break, before the first crash of the day hampered the progress of a group of riders at the back of the pack. As winds fanned a forest fire nearby, Vichot and Howard continued to blaze a trail out in front, opening up a lead of around four minutes. The leading duo were eventually caught with 61 kilometres to go, with Nairo Quintana (Movistar) among the GC riders to occupy a position towards the front. With 32km to go, the field began to bunch up once again, before Mark Cavendish (Dimension Data) - fancied by some to win this stage - suffered with mechanical issues that dashed his chances of a win. But Sagan and Froome headlined up a stunning sprint finish, strengthening their grip on their respective jerseys in the process.